alaTest has collected and analyzed 2456 reviews of Samsung Google Nexus 10 (P8110). The average rating for this product is 4.2/5, compared to an average rating of 4.3/5 for other products in the same category for all reviews. Opinions about the design and price are overall positive. The usability and screen are also appreciated. Some have doubts about the storage and battery, while there are some mixed comments about the camera. We analyzed user and expert ratings, product age and more factors. Compared to other products in the same category the Samsung Google Nexus 10 (P8110) is awarded an overall alaScore™ of 91/100 = Excellent quality. 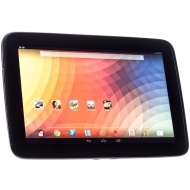 alaTest has collected and analyzed 535 user reviews of Samsung Google Nexus 10 (P8110) from Amazon.co.uk. The average user rating for this product is 4.2/5, compared to an average user rating of 4.3/5 for other products in the same category on Amazon.co.uk. Comments about the portability and design are on the whole positive. The screen and usability are also appreciated. Many are critical about the reliability. alaTest has collected and analyzed 714 user reviews of Samsung Google Nexus 10 (P8110) from Amazon.com. The average user rating for this product is 4.1/5, compared to an average user rating of 4.1/5 for other products in the same category on Amazon.com. Reviews about the design and battery are on the whole positive. The screen and performance also get good reviews, but there are some mixed reviews about the reliability. Google's latest reference tablet packs an amazing resolution but ultimately fails to distance itself from the competition. The Google Nexus 10 has one of the best tablet designs yet, and its screen is beautifully sharp. The ; has a beautifully sharp screen. It's light, durable, and receives regular OS updates. Photo Sphere is an incredibly cool concept. Google's content ecosystem is only getting better. The Nexus 10's durable design, consistent updates, and good performance make it one of the best Android tablets to date. Editors' note (December 6, 2013): We've lowered the performance score of the Nexus 10 due to recent releases of more powerful tablets in the marketplace. The Nexus 10 has a beautifully sharp screen. It's light, durable, and receives regular OS updates. Photo Sphere is an incredibly cool concept. Google's content ecosystem is only getting better.